This was originally posted at Origins, the blog of the Scholl Center for American History and Culture at the Newberry Library in Chicago. It features an interview with Edward J. Blum and myself about our book, in preparation for our appearance and lecture at the Newberry Library on Jan. 22. In the history of America’s religions, perhaps no figure has been more central than that of Jesus. With nearly three fourths of the population still self-identifying as Christian, Jesus remains central to large swaths of the nation. But from the moment Europeans first brought Christianity to the New World, Christ’s presence here has been contested. The Scholl Center’s own “Out of Many” program has been showing how Christianity has always been a religion-in-relation in America. 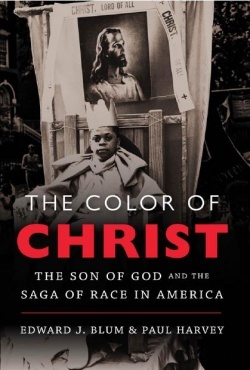 But in an important new book, The Color of Christ: The Son of God and the Saga of Race in America, historians Edward Blum and Paul Harvey chart how the image of Jesus in America has been a crucible for much of the nation’s history. From justifying the atrocities of white supremacy to inspiring the righteousness of the civil rights crusade, Jesus has been woven into American life. On Tuesdauy, January 22 both Blum and Harvey will be visiting the Newberry to give a“Meet the Author Talk” at 6pm in Ruggles Hall. The talk is free and open to the public. In anticipation of their visit, the Scholl Center reached out to the co-authors to learn more about their work and get a sense of what they hope to share. We hope to see many of you there.